I had the pleasure of reading Crazy Little Thing Called Love by Beth K. Vogt this summer. I have to tell you THIS is what summer reading should be! Fun, fast, romantic trials! It had it all!!! We meet Vanessa as she is about to plan her destination wedding - only her fiance wants it at the same place she lived with her previous husband! 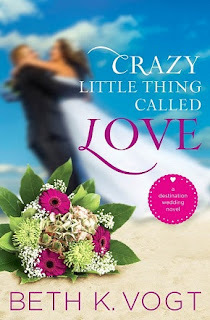 Vanessa has to go back to the town where friends know her and plan out a new wedding when of course who would be at the same destination then her ex-husband. You can imagine the scenario! Never expecting to see each other is awkward and fiery at the same time. Are they really over each other? Are the able to make amends with the past? Crazy events keep pulling them together - seriously this was a FUN FUN FUN read! Get your copy at your local book retailer or online at stores like Amazon!